It can be hard to tour both Moscow and St. Petersburg because of the distance between the two cities so when I came across the website of Mosturflot cruises and found a 12 nights cruise covering both a few days in Moscow as a stay in St. Petersburg I was sold. 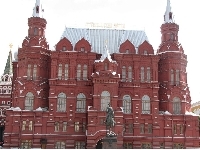 We spent day 1-4 in Moscow, we flew there with AirBerlin which was very good, and visited all major tourist attractions like the Red Square, the St. Basil’s Cathedral, the Lenin Mausoleum, Bolshoy Theater and the Olympic Stadium. From Moscow the cruise ship headed to pittoresque Uglich on the bank of the Volga River where we visited the Cathedral of Transfiguration. After Uglich followed Yaroslavl, Goritsy, Kizhi Island (famous for its open-air Museum of Wooden Architecture) and Verdant River Bank village Mandrogi before arriving in St. Petersburg where we spent day 10-13 of our cruise. It was a great way to tour Moscow and St Petersburg because we had enough time to explore both cities but got a chance to see some of Russia's country side as well. Our last day included breakfast and a transfer to St. Petersburg Airport. 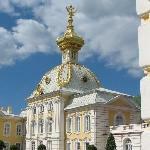 Did you enjoy Moscow and St. Petersburg tours and have you been on a holiday in Moscow, Russia?